Limited Edition of 950 prints, published in 2000. 24 x 34 inch size only. 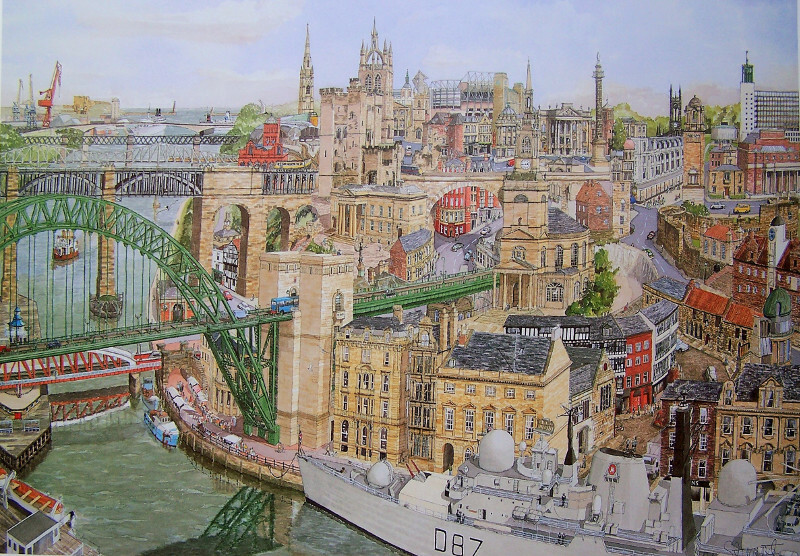 For my return to Newcastle in 2000, I again used many of the buildings and landmarks that caught my eye, many of which had featured in my first Newcastle print. Because of the strength of the riverside views, I again created an imaginary scene looking north across Quayside. For compositional reasons to show the cranes of Wallsend leading down towards Tynemouth, I had to reverse the River Tyne, so it ran westwards to the sea! In this Newcastle painting you can see the main central bridges, the Wall receives prominence, including Carpenters Tower, as does the Castle and the two cathedrals. The classical offices of Quayside contrast dramatically with the naval architecture of the HMS Newcastle, on one of her regular visits to the city. Many other familiar buildings appear as does the new Millennium Centre for life.